New for 2010: In celebration of the 12th annual Old House Fair (Sat. 6/19, 10am-4pm in South Park), the organizers have published a self-guided bike or walking tour of historic homes in the neighborhood. 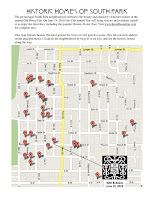 For a printed copy, visit Thomas Community Bike Shop on Fern St., or download a copy from the website (click on Bike/Walk Tour tab): www.TheOldHouseFair.com. On the day of the Fair, copies will be available at the Info Desk at 30th & Beech, and there will be a bike corral and bike rental services nearby as well. Also on tap are free walking tours by neighborhood historians (at 11 and 2), a $5 Trolley Tour, and the always-popular Historic Home Tour ($20, includes 5 docent-led tours of historic houses, including one designed by Irving Gill). Visit the website for complete information.